When David Will wakes up on the morning of his 25th birthday next Thursday, he may still be scratching his head about what happened in ‘s-Hertogenbosch, The Netherlands this afternoon.Because although he is well-known on his national circuit in Germany, and contributed to his country’s victories in the FEI Nations Cup™ at Linz, Austria in 2011 and at Wellington, Florida last year, not even he could have expected to leave the elite of the sport floundering in his wake as he galloped to victory in the last qualifying leg of the Rolex FEI World Cup™ Jumping 2012/2013 Western European League series today. Will David (GER) - Colorit. Winner of the Rolex FEI World Cup presented by Swiss Sense. Following a nonchalant first-round performance he went through to the nine-horse jump-off in which he crushed his considerably more-experienced opponents with another superb cruise around the track.He has just one top horse, the grey stallion Colorit which owner Klaus Isaak has entrusted to him for the past year, but this bright new star rider has broken into the big league after today’s result which left Australia’s Edwina Tops-Alexander and the brilliant Itot du Chateau having to settle for runner-up spot while three-time Rolex FEI World Cup™ Jumping champion, Germany’s Marcus Ehning, finished third with Copin van de Broy. Ehning remarked afterwards that he wasn’t entirely taken aback by Wills’ winning performance. “I know David, he is a very fast rider and he has beaten me already a few times, so this is not the first!" he insisted.Will couldn’t hide his delight however, hardly daring to believe in what he had achieved. His expression of pure amazement as, one by one, his former superiors all fell short of his extraordinary target-time in the jump-off said it all.“I wasn’t sure I was going to win until the very end” said the rider whose career now looks set on a whole new trajectory. Ehning describing the first-round course set by Dutchman Louis Konickx as “very clever”.He said “it was really fair, with great distances, but horses had to be really under control, and the last fence was a bit of a joker”.It was no laughing matter for the two who made it all the way there only to put it on the floor however - Finland’s Maiju Mallat with Urleven van de Helle and reigning FEI European Champion Rolf-Goran Bengtsson from Sweden with Quintero la Silla who both seemed destined to make the cut into the timed round. Konickx set them questions from outset, with the snaking line from the triple bar at three to the vertical at four and the oxer at five requiring a good eye and absolute accuracy. This was followed by a right-hand sweep to the narrow FEI vertical at six which was followed on four easy strides by the triple combination with a tight inside distance between the first two elements and a much longer stretch to the oxer on the way out. There was little time to prepare for the oxer at nine following the vertical at eight, and fence 10 hit the floor regularly as balance on approach became an issue.The double at fence eleven came up quickly off the following left-hand turn and the long five strides to the penultimate oxer at 12 was the undoing of many.But the bogey final vertical was always going to prove problematic, located just past the entrance to the arena and curving away at an uninviting angle. Time and again horses hung back on the approach and didn’t have enough jump left to clear it.Germany’s Ludger Beerbaum and his promising nine-year-old, Zinedine, however were foot-perfect all the way only to fall foul of the 71 seconds time-allowed to pick up a single penalty and this proved good enough for tenth place in the final analysis. Sweden’s Malin Baryard-Johnsson set the pace against the clock with a competitive pathfinding round from H&M Tornesch who left all the poles intact in 36.68 seconds. The first three fences remained the same, but the triple bar was followed by a long run to the narrow vertical at fence six which was now jumped in the opposite direction before riders turned across the top of the arena to tackle the double and then cut sharply back to the new vertical at fence 16.From there there was a formidably long gallop down the full length of the arena to the final Rolex oxer, and, second to go, Will never flinched, looking the quintessential professional as he shaved over a second off Baryard-Johnsson’s time when clocking 35.73 to the undeniable amazement of the crowd. Two horses later the super-speedy partnership of Edwina Tops-Alexander and Itot du Chateau looked set to relegate the young pretender as they curved closer on every turn-back and angled the penultimate vertical.But the clock showed 35.84 seconds as they crossed the line, so Will was still out in front when Dutchmen Jur Vrieling (VDL Bubalu) and Marc Houtzager (Sterrehof’s Uppity) each collected four faults. There were still three to go as Ehning set sail on one of his classically smooth runs, but again he was 0.95 seconds slower than Will, and when Silvana HDC and Frenchman Kevin Staut hit the first element of the double and last man in, the home side’s Gerco Schroder, didn’t push New Orleans out of his comfort zone it was all over.Will would be the man taking centre stage. The unassuming 24-year-old, whose parents Sonja and Martin run a riding school at Chiemgau in Bavaria, trains and works with Dietmar Gugler who coaches young riders and produces horses from his equestrian centre near Frankfurt. Will has had Colorit for just over a year. “I got him last February and our biggest win before this was in the Grand Prix at Munich last year” he explained.“We were also third in the Riders Tour and he is a great horse, very consistent, and he places in nearly every Grand Prix he competes in” the rider added. Asked about his plan in today’s jump-off he said “I just tried to be as fast as I could. I wasn't sure I was going to win until the very end with all the big names coming after me, especially Edwina - in the end the difference was just the blink of an eye!" he pointed out. And his plans for the future after his sensational result today?“I’m going to Japan to compete there next week” he explained, “and my ambition is to go as fifth rider to some of the Super League shows so that I can prove myself and get more experience” he added.He has little to prove after today however having beaten so many of the best in the game, fair and square. Talking about the show, Gert Jan Swinkels, President of Indoor Brabant said-"the organisers are very satisfied and we would like to thank Rolex who have been with us for a lot of years. We have had 64,000 spectators this year and a really good atmosphere so it was a perfect show. We said goodbye to Salinero here yesterday but Anky (van Grunsven) has decided to become a member of our Board of Directors so we are very pleased and can expect a lot of good things to come from that”. And FEI Commercial Manager, Frederique Martin-Baste, confirmed the result of the Rolex FEI World Cup™ Jumping 2012/2013 Western European League qualifying series, pointing out that although he finished in 19th position, Rolf-Goran Bengtsson will join his Swedish counterparts Malin Baryard-Johnsson, Henrik von Eckermann and Jens Fredricson at the Rolex FEI World Cup™ Final in Gothenburg in a few weeks time because Australia’s Edwina Tops-Alexander, who holds 18th place, qualifies from her own region. The stage is set for a fantastic end to a brilliant series, but this evening was all about the emergence of a new German star in the shape of David Will who once again demonstrated the unpredictable nature of the great sport of Jumping. For further information on round 12 of the Rolex FEI World Cup™ Jumping 2012/2013 series at ‘s-Hertogenbosch, The Netherlands go to websitewww.indoorbrabant.comor contact Press Officer Denise van der Net, Emailinfo@denisevandernet.nlor Tel +47 959 26 347.The Rolex FEI World Cup™ Final 2012/2013 will take place in Gothenburg, Sweden from 24 to 28 April 2013.For all information on the Swedish fixture check outwww.gothenburghorseshow.comor contact Press Officer Mayvor Thorin, Emailmayvor.thorin@gotevent.se, Tel +46 31 368 43 49. 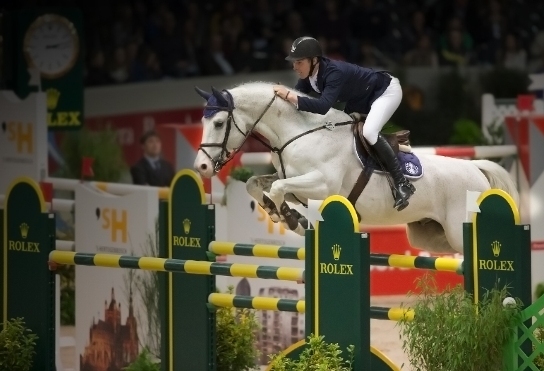 Hertogenbosch in The Netherlands presented the last opportunity for riders in the Western European League to collect points towards qualification for the Rolex FEI World Cup™ Jumping Final which wlll take place in Gothenburg, Sweden from 24-28 April. 38 horse-and-rider combinations, representing 15 nations, started in today's competition. Course designer was The Netherlands' Louis Konickx. 13 fences in first round with four verticals standing at maximum 1.60m - fences 4, 8, 10 and 13. Youngest horses in today's competition were both nine-year-olds - the KWPN bay gelding Glock's Zaranza (Karandasj x Heartbreaker) ridden by Austria's Robert Puck and the KWPN chestnut stallion Zinedine (Guidam x Heartbreaker) competed by Germany's Ludger Beerbaum. The oldest horse in the competition was Cevo Itot du Chateau, the 17-year-old Selle Francais chestnut gelding (Le Tot de Semilly x Galoubet A) ridden by the lady holding No. 5 position on the current Longines Jumping rankings, Australia's Edwina Alexander. 10 mares, 13 stallions and 15 geldings competed in today's class. 9 horse-and-rider combinations qualified for the second-round jump-off against the clock. Just one rider picked up a single time fault - Germany's Ludger Beerbaum who slotted into tenth place with Zinedine. David Will - “This was not my first World Cup Grand Prix, I was allowed to ride in Stuttgart last year and had one down. It is a very different experience at this level if you come from 3 or even 4-star shows”. Edwina Tops-Alexander talking about today’s jump-off - “I had a great shot from fence one to two and three, to the next fence, the FEI fence it was a long 8, I almost thought I could do it on 7 but it was quite long. I got a good shot to the double and vertical - David did 6 there and I did 7 - but I was not quite good enough on the turn to the last - that's where I lost it and he won it!"